Master's Sun (Hangul: 주군의 태양; RR: Jugun-ui Taeyang) is a 2013 South Korean television series starring So Ji-sub and Gong Hyo-jin. The horror-romantic comedy is written by the Hong sisters, and aired on SBS from August 7 to October 3, 2013, on Wednesdays and Thursdays at 21:55 for 17 episodes. Joo Joong-won (So Ji-sub) is the cold and distant CEO of Kingdom, a conglomerate that includes a major department store and hotel. He meets the gloomy Tae Gong-shil (Gong Hyo-jin), who started seeing ghosts after an accident. 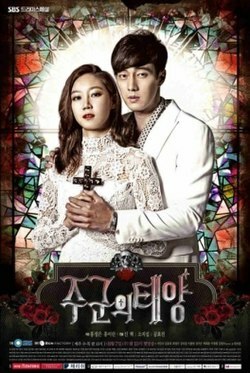 Their lives take a new turn as they discover whenever Gong-shil touches Joong-won the ghosts that surround her disappear; after much pleading from Gong-shil to allow her to stay by Joong-won's side in return she must help him recover a fortune that was stolen from him during a kidnapping attempt. Gong-shil was once a bright and sunny person. But after a mysterious accident, she suddenly gains the ability to see ghosts. They continually haunt her - some wanting her to fulfill their last wishes, others merely scaring her. Gong-shil becomes an outcast, unable to hold down a job and suffers from insomnia. She then works as a cleaning lady at Kingdom shopping mall after she discovers that the ghosts are banished whenever she touches the company president, Joong-won, the most selfish man she's ever known. She begins working for him as his secretary (in name only) and because of Joong-won, she slowly opens herself up to the world. A former soldier who served in the Zaytun Division of the South Korean Army, which was deployed to Iraq in the mid-2000s. After his discharge, he uses that experience and skill set in pursuing a job in the private sector, thus leading him to become hired as the head of security of Joong-won's shopping mall company. He mysteriously keeps tabs on Joong-won, and notes the latter's interest in Gong-shil, who is his neighbor at the apartment building he'd recently moved into. As part of his plan, Kang Woo confesses that he likes Gong-shil, but his feelings soon begin to turn real. A top star and the model of Joong-won's shopping mall. Yi-ryung's wedding to a soccer player is inadvertently wrecked by Gong-shil, whom she considered her high school rival. Though not related, they share the same surname and in high school they were given the following nicknames: the then-more popular Gong-shil was called "Big Sun," while the homely Yi-ryung, who wore braces and glasses, was called "Little Sun." Wanting revenge against Gong-shil for her bitter high school experiences and ruined wedding, Yi-ryung plans on seducing Joong-won, but finds herself falling for Kang Woo instead. Joong-won's ex-girlfriend. Raised in an orphanage, the shy Hee-joo meets Joong-won there and falls in love with him. Later on, she was killed in the botched kidnapping scheme. Originally thought to be a victim, Joong-won learns that Hee-joo was working with the kidnappers, a fact that he does not reveal to anyone until he meets Gong-shil. However, it is later revealed Hee-joo did not die. In fact, it is actually Hanna who died and follows Joong-won as a ghost. Hee-joo's twin sister. Born to two poor artists who died in an accident, the twins were separated. Hanna was adopted and raised comfortably in England, while Hee-joo grew up in an orphanage. After the twin sisters meet in their teens, Joong-won falls in love with the outgoing and sweet Hanna, whom he mistakenly believes to be Hee-joo. Driven by jealousy, Hee-joo masterminds the kidnapping, leading to Hanna's death. Afterwards, Hee-joo assumes her twin sister's identity and returns to England as Hanna. She later undergoes cosmetic surgery to change her facial features and moves next door to Aunt Sung-ran in order to continue her revenge against Joong-won. Sung-ran's much younger husband, and vice president of Kingdom Group. Joong-won's secretary, who also happens to be a lawyer and child psychologist. He is supportive of Joong-won and Gong-shil's relationship. Secretary Kim is later revealed to be Hee-joo and Hanna's uncle. Gong-shil's older sister who works at a coffee shop. Joong-won's father. He hired Kang Woo to secretly spy on his son. Member of Kingdom's security team. A meddlesome busybody and security team member at Kingdom shopping mall. He falls in love with Tae Gong-ri. A man who can see ghosts. He fell in love with Gong-shil's spirit while her body was in a coma. Little boy who lives in Gong-shil's apartment building. Top soccer player. He is engaged to Yi-ryung, and they're about to be married in a lavish wedding sponsored by Kingdom Group. But their arguments about their future yield no compromise; he wants to keep playing soccer abroad despite his age and injuries, while she wants him to stay in the country so that they can become the "Korean Becks and Posh." Hye-sung has never gotten over his girlfriend Mi-kyung, whom he believes dumped him cruelly before he became famous, thus driving him to succeed. Ghost in bridal gown, Hye-sung's dead ex-girlfriend. She and Hye-sung were happy and in love, and she whole heartedly believed in his athletic abilities. But when Mi-kyung learned that she was terminally ill, she broke up with Hye-sung without telling him the reason. After seeing him in a loveless relationship with Yi-ryung, her ghost reappears before him, leading him to cancel the wedding and decide to keep playing soccer. He blackmails Hye-sung using Mi-kyung's name, knowing full well that she's already deceased. His house is built in the middle of the land Joong-won is planning to turn into a golf course. He previously agreed to sell his house to Joong-won, then reneges on their deal, saying his dead wife opposes his decision to sell, since the flower on her favorite plant never wilts. Joong-won cuts off the flower, and gets his contract. The man tells Joong-won, "If ghosts exist, they'll get you for sure." The ghost of his elderly mother appears before Gong-shil to hand over her bankbook containing ₩10 million for her funeral expenses and to pay off their debts. Instead, the son gambles away the money. He tries to kiss her, but Gong-shil pushes him away after seeing a ghost over his shoulder. Leader of a three-member schoolgirl clique, who think they're being haunted by the ghost of a classmate they ignored. Member of the schoolgirl clique. Schoolgirl ghost. Eun-seol had wanted to be Ga-young, Yoo-jin and Joo-hyun's friend. She followed them to Kingdom Mall one day, but after overhearing them mocking her, she ran away and was hit by an oncoming truck. Later, the three tearfully apologize for treating her badly, and Eun-seol shows her forgiveness when a nearby vending machine drops three sodas, in their favorite flavors. Another classmate who wanted to scare the clique, after witnessing them being mean to Eun-seol that day at the mall. So using the cellphone that Eun-seol had left behind, Ji-eun sent the three a photo of themselves in front of the mall's fountain with a photoshopped Eun-seol. Red shoe ghost. A wealthy woman whose mother owns buildings in the affluent Gangnam District. Yoon-hee not only catches her husband cheating on her, she also overhears him telling his mistress that he plans to kill her and make it look like a hiking accident. He sees her and chases her through the empty mall (making her lose one of her red shoes), and while driving to get away from him, her car hits a parked truck and Yoon-hee dies. A store owner in Kingdom Mall. He acts as Yoon-hee's devoted husband, and later, a grieving widower. But in reality, he plans to kill his wife and his mother-in-law to get his hands on their money. Gong-shil and Joong-won reveal the truth about his misdeeds, though Joong-won gruffly claims he only did it because the culprit had been planning to transfer his store to Kingdom Mall's competitor, Giant Mall. She possesses vain and insecure women, telling them, "You're the most beautiful." Groom ghost. Because of his sickly constitution, he never left his grandmother's mansion. Ji-woo fell in love with Sun-young, the tomboyish girl who delivered milk to their house. Too embarrassed to tell her that he likes her, he constantly teased and bickered with Sun-young. But before he could confess, he fell ill and died young. Milk delivery girl. After Ji-woo teasingly compared her to a green rose, cabbage-looking and not very pretty, he kissed her. But she ran away, thinking he was just messing with her. After Gong-shil and Joong-won track her down, she learns the truth about Ji-woo's feelings and cries upon seeing the bouquet of green roses in his room that never wilts. After the ghost of Ji-woo leans in to kiss Sun-young one last time, President Wang sees the flowers finally wilt and disappear. Gong-shil tells Joong-won that green roses symbolize a rare noble love that only exists in heaven. Ji-woo's grandmother, and company president. She believes that her grandson's spirit isn't at peace because he died without ever falling in love, so she hires a shaman to arrange a ghost marriage for him, but Ji-woo keeps rejecting the brides. Initially planning to invest in Giant Mall, Wang offers to back Joong-won financially if he'll let Gong-shil become her grandson's ghost bride. Shaman and famous ghost matchmaker of the upper crust. She tells Gong-shil that the reason ghosts are drawn to her and seek her out is because she shines so brightly, ominously adding that Gong-shil needs to be on her guard because "They’re looking for an opportunity... to return." A soldier who'd found it tough adjusting to mandatory military service, until he was assigned to train an army dog. They become the best of friends, with the dog defending him from bullies and Hyung-chul teaching the dog to dance to "Nobody," a song by his favorite girl group (Note: This part of episode, the music of Nobody of Wonder Girls changed to Haru by SHINee in the televised broadcast in the Philippines by GMA-7). After the dog fell ill, Hyung-chul is ordered to put down the animal, and the trauma drives him to go AWOL. His ghost dog appears before Gong-shil, and she and Joong-won prevent Hyung-chul from committing suicide. A young boy who's a victim of child abuse. His doll is haunted by three children who'd died from similar parental neglect and violence. In the process of rescuing him, Gong-shil and Joong-won get arrested for trespassing and kidnapping, but are later released. Kingdom Group pays for Chang-min's medical bills and reports his mother for her crime. An overworked and under-appreciated ajumma who received a voucher for Kingdom Hotel and enormously enjoyed her stay there. Now comatose at a hospital, her spirit keeps haunting the hotel swimming pool because she never wants to leave. Gong-shil urges her to return to life, and Gil-ja wakes up and sees her family tearful with gratitude at her recovery. A famous concert pianist who was utterly dependent on his wife, and can't get over her recent death. When the ghost of his dead wife possesses Gong-shil's body, he attempts to take her to Paris with him as his muse. Gong-shil helps her bake a pie for her husband (their ritual before every concert). She borrows Gong-shil's body to drive some sense into her husband one last time. Tired of living in Louis's shadow when she was alive, she tells him that he's not picky but lazy, and that he has to let her go. A chaebol heiress. During Joong-won's business trip to China, she agrees to become his fake fiancee. The arrangement is mutually beneficial for both; it enables Seo-hyun to take over her family's company Sejin Group (a parody of Empire of Gold), and Joong-won uses her to keep Gong-shil at arm's length. Joong-won breaks the fake engagement after one week. CEO of Giant Mall, business rival of Kingdom Mall. He's grieving over the death of his father, but also angry because he believes that his father had had a mistress, since women's clothing, makeup and perfume were found scattered in his father's house. Chairman of Giant Mall, and Jae-seok's father. His ghost eventually reveals that he hadn't been unfaithful to his wife, but instead was secretly a cross-dresser. The ghost of a little boy who was accidentally killed when a mechanic hit Woo-jin with his car. Thinking that Gong-shil witnessed the crime, the mechanic attempts to kill her, but Joong-won protects her and nearly dies instead. Japan – LaLaTV – April 5, 2014. Philippines – GMA Network – May 19 to July 10, 2014, with the theme song 'Right where you belong and re-run in August 3, 2015 replacing Secret Garden on the network's Heart of Asia Mornings with the theme song 'Heart'. Then on January 2, 2017, it aired on GMA News TV at 11:00 PM Monday to Friday. GMA also replaced all of the original Korean names of the entire cast into a more Western-sounding name so audience can relate more. Singapore – MediaCorp – November 11, 2014. Vietnam - VTC9 - January 14, 2015. Indonesia – RCTI – January 8 to 27, 2015. India – Puthuyugam TV – March 23, 2016 – April 1, 2016 replacing The Heirs. Thailand – Channel 7 – July 22, 2016. ^ Lee, Sun-min (April 10, 2013). "So Ji-sub and Gong Hyo-jin to play lovers in Sun of the Master". Korea JoongAng Daily. Archived from the original on April 17, 2013. Retrieved June 14, 2013. ^ Jeon, Su-mi (April 26, 2013). "So Ji Sub and Gong Hyo Jin Cast for The Sun of the Lord". enewsWorld. Retrieved June 14, 2013. ^ Lee, Hye-ji (April 29, 2013). "So Ji-sub, Kong Hyo-jin Cast in Romantic Comedy". TenAsia. Archived from the original on March 28, 2014. ^ "Interview with Romantic Comedy Queen Gong Hyo-jin and So Ji-seob of Drama Master's Sun". KOFICE. September 25, 2013. Retrieved July 25, 2014. ^ Kang, Jung-yeon (July 4, 2013). "Kong Hyo-jin, So Ji-sub, Seo In-guk Readying for New Drama". TenAsia. Archived from the original on March 28, 2014. ^ Lee, Cory (October 4, 2013). "Master's Sun Ends Run atop TV Charts, Breaking 20 Percent Mark". TenAsia. Archived from the original on March 28, 2014. ^ Kim, Gwang-kuk (August 7, 2013). "PREVIEW: SBS Wed/Thu Drama Master's Sun". TenAsia. Archived from the original on March 28, 2014. ^ Kim, Joy (May 21, 2013). "Actress Kong Hyo-jin announces comeback for TV drama". BNTNews. Retrieved June 22, 2013. ^ Lee, Claire (April 30, 2013). "Actress Gong Hyo-jin to star in horror TV drama". The Korea Herald. Retrieved June 14, 2013. ^ Jones, Julie (April 21, 2014). "Gong Hyo Jin Talks About Her Funny Appealing Leading Men". KDramaStars. Retrieved July 25, 2014. ^ Lee, Sun-min (July 31, 2013). "So Ji-sub praises female co-star". Korea JoongAng Daily. Retrieved July 31, 2013. ^ "So Ji Sub On Master's Sun: "I Still Feel Like Joo Joong Won"". Soompi. October 5, 2013. Retrieved October 15, 2013. ^ MacDonald, Joan (October 7, 2013). "So Ji Sub Was Surprised To Discover He Was Funny". KDramaStars. Retrieved July 25, 2014. ^ Lee, Eun-ah (July 17, 2013). "INFINITE's L to Make Cameo Appearance in So Ji-sub Drama". TenAsia. Archived from the original on March 28, 2014. ^ Choi, Eun-hwa (August 2, 2013). "Interview: Infinite's L Says His Voice Broke for The Sun of the Lord". enewsWorld. Retrieved August 3, 2013. ^ Lee, Eun-ah (August 5, 2013). "Teaser of INFINITE's L on the Set of Master's Sun Released". TenAsia. Archived from the original on March 28, 2014. ^ Jeon, Su-mi (June 4, 2013). "Seo In Guk Cast in Hong sisters' The Sun of the Lord". enewsWorld. Retrieved June 14, 2013. ^ Lee, Eun-ah (June 4, 2013). "Seo In-guk Cast in Kong Hyo-jin, So Ji-sub Drama". TenAsia. Archived from the original on March 28, 2014. ^ "Seo In-Guk joins So Ji-Sub and Gong Hyo-Jin in Master's Sun". Asia Today. June 5, 2013. Retrieved June 22, 2013. ^ Jeon, Su-mi (August 12, 2013). "Seo In Guk Acts as the Mysterious Kang Woo in Master's Sun". enewsWorld. Retrieved August 28, 2013. ^ "Jin Yi-Han, Beckham of Korea .. King's Sun". Innolife. August 4, 2013. Retrieved August 29, 2013. ^ Son, Bo-kyung (July 8, 2013). "Kong Hyo Jin Returns as a Girl Who Can See Ghosts for The Sun of the Lord". enewsWorld. Retrieved July 8, 2013. ^ Kang, Jung-yeon (July 24, 2013). "Girl's Day Minah to Appear in So Ji-sub's Drama". TenAsia. Archived from the original on March 28, 2014. ^ Hong, Grace Danbi (August 28, 2013). "Yoon Mirae Touches with Love for Master's Sun OST". enewsWorld. Retrieved August 29, 2013. ^ An, So-hyoun (August 21, 2013). "SISTAR's Hyorin to Sing for Master's Sun". enewsWorld. Retrieved August 29, 2013. ^ Hong, Grace Danbi (August 7, 2013). "Gummy Sings Day and Night for The Sun of the Lord". enewsWorld. Retrieved August 29, 2013. ^ "TNMS Daily Ratings: this links to current day-select the date from drop down menu". TNMS Ratings (in Korean). Retrieved August 7, 2013. ^ "AGB Daily Ratings: this links to current day-select the date from drop down menu". AGB Nielsen Media Research (in Korean). Archived from the original on December 26, 2013. Retrieved August 7, 2013. ^ Lee, Cory (January 2, 2014). "Lee Bo-young Grabs 1st Top Prize at the 2013 SBS Drama Awards". TenAsia. Archived from the original on March 28, 2014. ^ "เรื่องย่อ รักป่วนวิญญาณหลอน The Master's Sun". kapook (in Thai). July 22, 2016. Retrieved August 12, 2016.